Three musical bikes have gone missing ahead of a large-scale Centenary of Canberra event this Friday night, as bike makers continue efforts to create 100 musical bikes for The Canberra Pursuit. 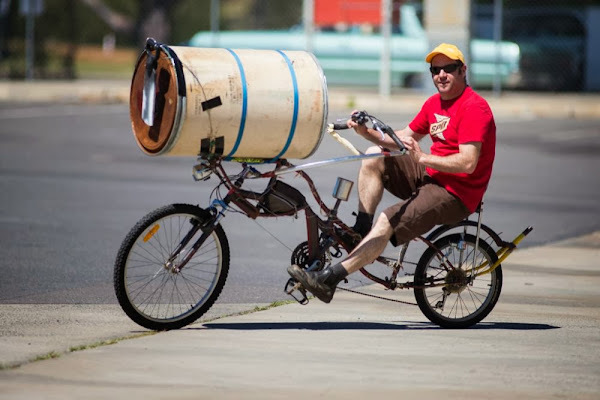 The General Manager of the Centenary of Canberra, Adam Stankevicius, is asking the public to keep an ear out for the bikes, which create a range of pedal-powered sounds including the screech of a Yellow-tailed Black Cockatoo and the sound of a continuous rain stick. “The musical bikes were last seen on the weekend in the garage of a bike maker’s house in central Scullin just before being taken to the TAMS Depot hangar in Fyshwick,” Mr Stankevicius said. “Parts of the cockatoo bike were later found strewn across Scullin oval. “We ask anyone who has seen or heard the bikes to contact the Centenary, as the hour-long performance is just days away and bike makers are working tirelessly to build 100 bikes. Pictured is Nancy Porker’s drum bike and testicle remover, not one of the stolen bikes but to give you an idea of the sort of thing. Picture by Martin Ollman. My own Air Raid Bike is unaffected as far as I know. So have the bikes turned up? This must be a horrible thing for the people who have spent so many hours creating them. Also is Nancy Porker related to Goosepig? Or is PorkHunt involved? Sometimes the best thing about this site (and there are many lovely things) is the nursery rhyme nomenclature.